Bootstrapping, pitching, talking, planning—never mind all of the newer sites that allow regular folks to invest directly in private companies. The capital-raising process is exhilarating but exhausting. It can feel like there are a million channels to keep up with when you’re trying to raise capital: credit cards, friends, and family, crowdfunding, angel investors, venture capital, private equity. What unites all of them? The desire to support entrepreneurs, generate returns, and potentially be a part of the next big thing. But with all the opportunities out there, how do they decide which company to back? Aside from the cache of a charismatic founder or a promising young team, the main driver can be found in the numbers. To raise capital efficiently and effectively, you need to be able to prove what you’re doing. Market Size: If you’re going after a large market, how much of a market share will you need to gain? How will you gain it? Going after a smaller vertical market? How do you plan to grow your average revenue per customer over time? Market Competition: The last thing investors want to hear is that your market has no competition—they know that’s not true (so do you). A more true statement would be, “There’s no one doing exactly what we do, how we do it—but there are other companies who believe they can.” You need to have in-depth knowledge of your competitive space. Know who your competition is, how they think they’re a threat, and how you’ll manage that risk. Investors will have more faith in you. Market Volatility: Be aware of perceived volatility in your market. Perception is reality, and your potential investors aren’t as well-versed as you in your industry. They may believe headlines and news snippets. Think about everything from changing regulations, potential political repercussions, changing demographics, being outpaced by newer technology, etc. And think about how you’ll minimize or mitigate that volatility—diversifying product offerings, awareness campaigns, and creating value from headlines. Product Risk: Somewhat linked to Market Volatility, product risk is all about investors wanting to understand how you plan to stay on the forefront of innovation, continually address your market’s changing needs, and defend your intellectual property. Investors will ask you these questions, and your answers will show how forward-thinking (or not forward-thinking) your company is. Execution Risk (a.k.a. Team Risk): Investors need to know your likelihood of survival—that you’re planning for the future in terms of how you’ll acquire, retain, and scale new customers profitably. Companies need to achieve a certain stage of growth before data will be considered valid by investors, but that shouldn’t limit your knowledge sharing. Pre-revenue, sharing anecdotal information is a must: Think ratio of Customer Lifetime Value to Customer Acquisition Cost, for example. As your company grows, you’ll have increased opportunity to use your data (not just anecdotes) as stand-alone evidence of traction to share with investors. Customer Acquisition Cost (CAC) to Lifetime Value (LTV) ratio– Key Value: Average Deal Size. But, if there’s a positive trend you want to show, break Average Deal Size growth into its own graph. Conversion by Lead Source– Key Value: Sales Cycle. How long does it take you to close a deal? You’ve gathered your metrics, now you need to share them. The most powerful way to build and maintain real-time data transparency: Dashboards. “We’ve implemented Grow and invited all of our board members and advisors as users with access to their own real-time dashboard. Our commitment to transparency stems from recognizing our fiduciary duty to create the most value from invested capital for our investors,” says Horne. Spend some time strategizing who really needs access to your dashboard, and how you’ll plan to manage feedback. The right metrics can help you source funding from great investors, but more importantly, they are critical to the life and health of your business. Track continuously. Share often. Because everything you need to know is in your data. About CampusLogic: CampusLogic transforms the way colleges and universities deliver financial aid with the first and only student self-service platform. Modern, mobile, and paper-free, CampusLogic’s cloud-based software simplifies financial aid management, so more students can complete financial aid and get into the classroom. With nearly 40 institutions and 300K+ active students, our customers optimize efficiencies, increase enrollment, and improve the student experience. Recently, CampusLogic won Invest Southwest’s Venture Madness, the Arizona Commerce Authority’s Arizona Innovation Challenge, and was recognized as the 2015 Ed Tech Innovator of the Year and 50 Most Promising Education Tech Solution Providers by CIO Review. 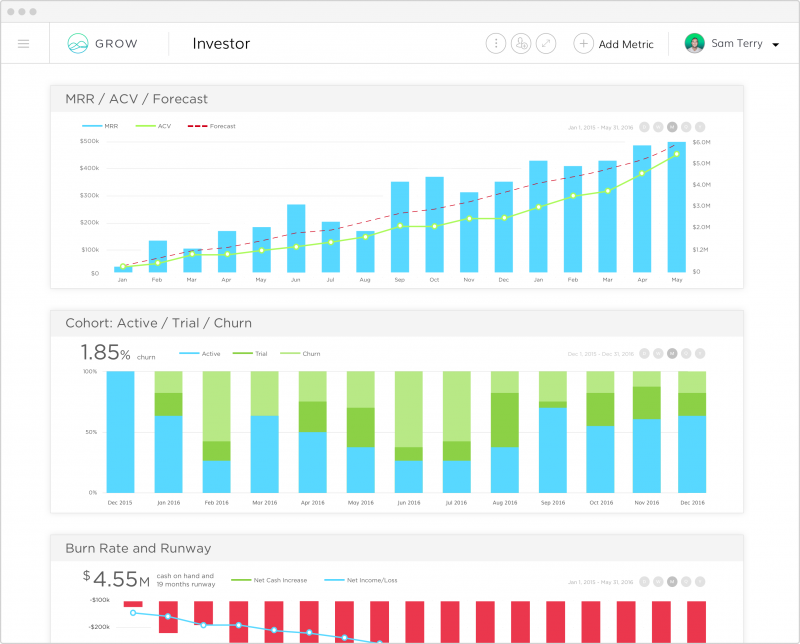 About Grow: Grow is a business intelligence software solution that empowers businesses to become truly data-driven and accelerate growth by aligning team objectives and inspiring strategic decisions. With Grow’s custom, real-time data dashboards, enterprise-quality data insights are attainable for any business. Grow recently raised $11M, including $9M in Series A from Toba Capital.